From the Ashes documents the incredible achievement of the 1868 Aboriginal first-ever cricket team through the eyes of a young team of Indigenous cricketers. It focuses on two players - Worrin Williams and Cameron Trask - and their journey to England in June 2009 as part of the Cricket Australia Indigenous XI team. It's a journey of selfdiscovery, adventure, challenges, and extraordinary Indigenous heritage. Worrin and Cameron represent a new generation of Aboriginal men who want to succeed at the highest level in their sport and their lives. They begin their journey in Harrow, Victoria where they meet relatives and historians who share with them the lives and stories of the men who played for Australia 140 years ago. They visit the Johnny Mullagh Cricket Centre and meet with Ian Friend who is the great-great grandson of Charles Lawrence, the captain and manager of the 1868 team. Cameron and Worrin then join the squad for an intensive training camp in Brisbane before heading to London where they play a series of games over a four week tour of England. 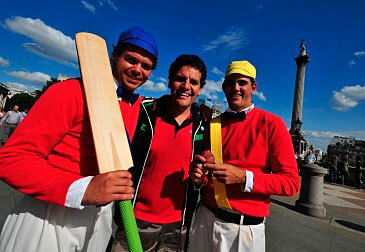 They visit the ovals where the 1868 team played, try out the uniforms, even drink the post match beers. After a long and exhausting tour, the young men return home and begin to make choices in their own lives, inspired by their efforts on tour and the efforts of those who played 140 years ago. From The Ashes is narrated by Queensland actor William McInnes. The documentary was produced by Aboriginal-owned new media company Carbon Media for the ABC with the support of Cricket Australia.